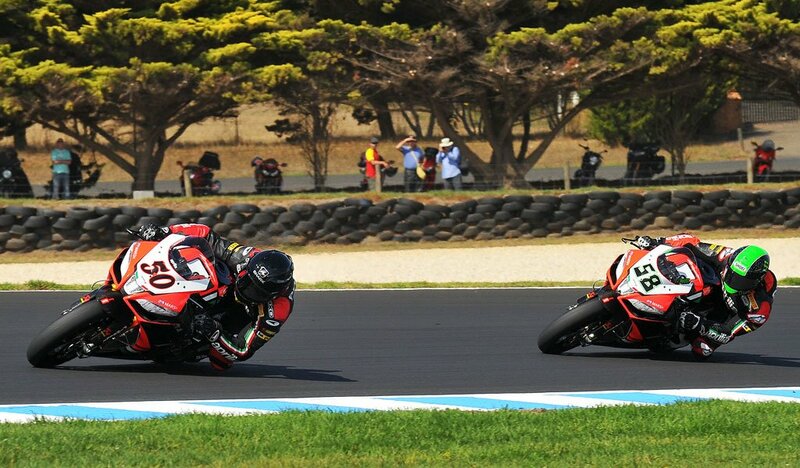 Max Biaggi who? 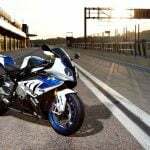 The Roman Emperor’s retirement after winning the 2012 World Superbike Championship marked the end of an era for Aprilia, with the 2013 campaign marking the first without Biaggi since the Italian manufacturer came back to the WSBK scene with the RSV4. If Aprilia misses its two-time WSBK Champion, it sure didn’t show it with a dominating display at the 2013 season opener in Australia. 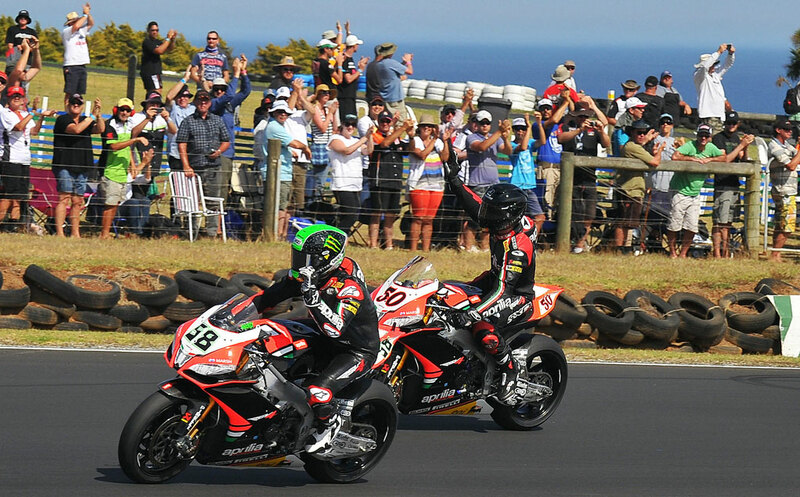 Aprilia riders swept the podium in Race One at Phillip Island and nearly did it again in Race Two, taking three of the top four spots. 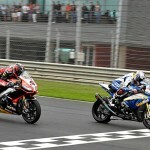 Factory riders Sylvain Guintoli and Eugene Laverty swapped a couple of one-two finishes while Red Devils Roma Aprilia rider Michel Fabrizio added a third- and a fourth-place finish to complete a nearly perfect start for Aprilia’s post-Biaggi era. Speaking of the start of a new era, Carlos Checa gave the new Ducati 1199 Panigale R a good start in its WSBK debut by taking the Superpole and lining up first on the grid. That was the high point for Ducati however Checa crashed out on Lap 13 of Race One after clipping the end of Marco Melandri‘s BMW S1000RR. Checa suffered a concussion, putting him out of action the rest of the weekend alongside his Ducati Alstare teammate Ayrton Badovini who withdrew after breaking his foot in a crash during the first free practice session. Badovini was already a question mark going into the opener after suffering a hematoma of the liver in a pre-season crash. 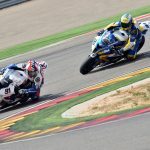 Laverty jumped into the lead at the first corner of Race One as he, Kawasaki‘s Tom Sykes and PATA Honda‘s Leon Haslem took advantage of a wheelie by Checa to get in front of the Spaniard. 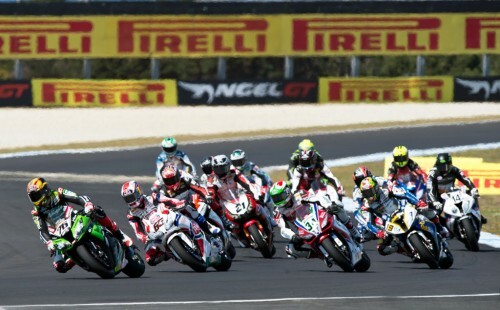 Laverty held the lead for the first 14 laps of the 22-lap race before being passed by his teammate Guintoli. Checa was also in the mix, fighting for a podium position when he clipped Melandri, sending both riders crashing out on Lap 13. 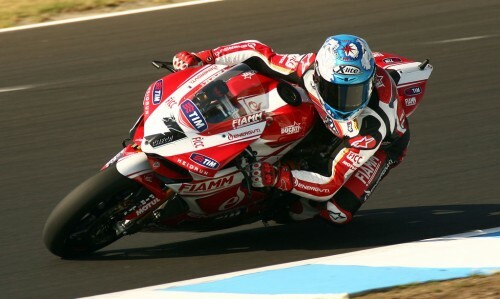 The incident pushed Fabrizio up a couple of positions to fourth place and, after passing Haslam on Lap 14, put Fabrizio into a battle with the two factory Aprilias for the top three spots. Fabrizio made it as high as second but eventually settled on a third-place finish behind Laverty and the race winner Guintoli. Race Two start with Laverty promoted to the pole position with Checa’s injury, but it was Sykes who took the early lead. Sykes’ advantage was short-lived however after a second-lap pass by Laverty with Guintoli following in his wake. The two factory Aprilias led for most of the race, with BMW GoldBet’s Melandri also fighting for podium positions. Laverty passed Melandri on Lap 20 and set his sights immediately on his teammate, regaining the lead just before the start of Lap 21. Laverty would hang on for the win, followed by Guintoli and Melandri with Fabrizio in fourth just missing another podium finish. After the first round, it looks like the Aprilia RSV4 riders have an advantage though BMW and Kawasaki are also competitive. 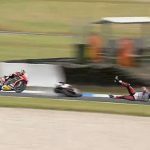 Chaz Davies had an impressive fourth-place finish in Race One for his debut in the Superbike class but he had to withdraw after two laps of Race Two after puncturing his rear tire in a collision with Kawasaki’s Loris Baz. Baz was taken off on a stretcher though he does not seem to be seriously hurt. His teammate Sykes finished fifth in both races but he’ll have to catch up to the Aprilias if he wants make up for the disappointment of losing the 2012 championship to Biaggi by just half a point.